Your vacant house can also be subject to vandalism, pest infestation, dry rot, overgrown vegetation, insurance cancelation etc. Without proper maintenance, even a nice home can become subject to a multitude of problems. 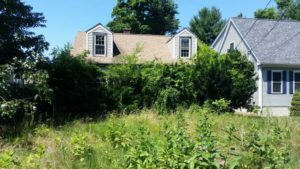 Owning a vacant house can be a headache on so many levels. So now you’ve decided that the vacant home needs to go, but you don’t want to spend a ton of money out of your pocket. So why not consider a cash sale. We buy houses, vacant homes, lots and land with no money out of your pocket. We even take care of the garbage. Hampden Homebuyers LLC has been buying homes in the Springfield metro area for over 10 years with a stellar reputation in the community. We pay cash for vacant homes, buy them as-is and can close within 2 weeks. Fill out our sell fast form at www.HampdenHomebuyers.com and see what we can do for you today!